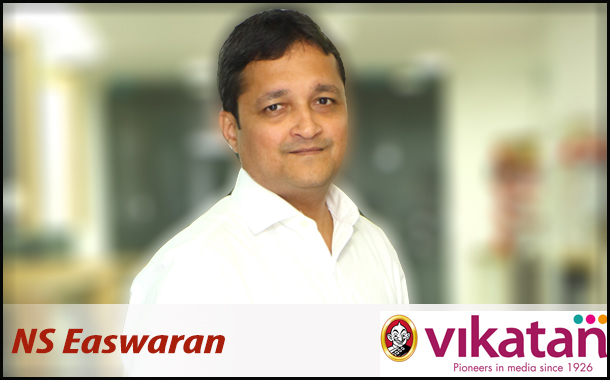 Chennai: Ananda Vikatan, Tamil Nadu’s leading media group with its strong presence in Print, Digital, Activations, Awards and TV Content has roped in NS Easwaran as their Chief Sales Officer in a newly created position in the organization. NS Easwaran has more than 20 years of experiences in Media industry, Ad sales and Marketing. Starting his career as a medical representative, Easwaran was earlier associated with New age Entertainment (P) Ltd, Pearl Media, Zee Entertainment’s Zee Telugu, Kannada & Tamil. He quit Zee Network as the Business Head of Zee Tamil at Chennai. In his last assignment, NS Easwaran was with Network 18 as Associate Vice President – Sales handling National Sales for News18 Tamil, Kannada & Malayalam along with the south region for all the 13 News Channels of the News 18. Handled sales for News 18 in Tamilnadu , Karnataka and Kerala markets . NS Easwaran has done MDP and Business Management education from IIM Ahmedabad and with Online Harward Management Program. B Srinivasan, MD of Vikatan Group said, Vikatan Group, with its 93 year legacy is the most trusted media group of Tamil Nadu is poised for the next level of growth. Vikatan has a strong presence in Print, Digital, Activations, Awards and TV Content and the core to our success has been our understanding of Tamil Nadu market and the pulse of our Readers, Viewers and digital followers. Through its multiple content delivery platforms, Vikatan Group curates content for its platform agnostic audiences with strong journalistic ethos, in-depth coverage and credibility. Marching towards its centenary, Vikatan Group is poised to grow with the millennial generation with strong underpinnings credibility & content creation. With such impeccable credentials, Vikatan has always remained a strong platform for brands that is looking at reaching out Tamil audiences. NS Easwaran, with his wide ranging experience across TV genres and exposure to regional markets, will drive a synergistic growth for the various media platforms. He will be instrumental in forging mutually beneficial relationship with advertisers by spearheading new revenue opportunities and bringing many national brands into Vikatan group. I welcome NS Easwaran into the Vikatan family and for taking it to newer heights.